While many architects moon over biennials and architecture festivals, these shows are often a bit esoteric for the general public. 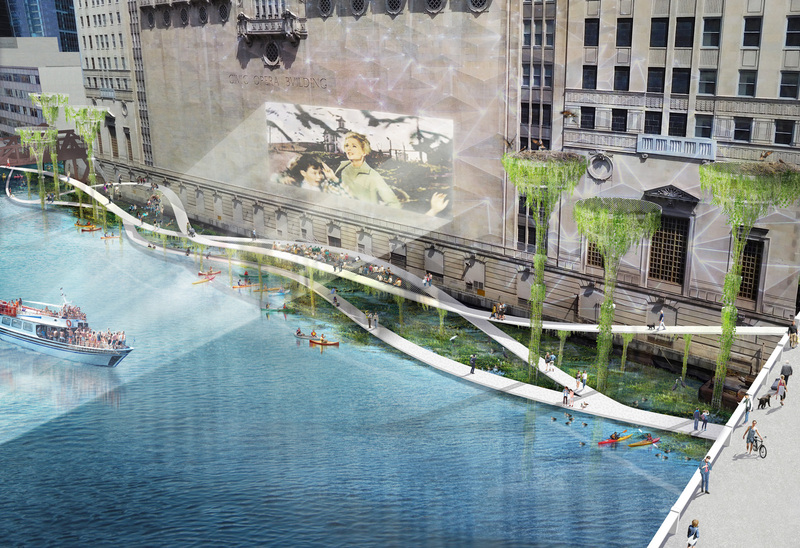 The Chicago Architecture Biennial (CAB) is no exception. Amidst the complex discussions and abstract installations, the average visitor may enjoy the show, but also feel a bit disconnected. However, there is one show at CAB that anyone would find accessible. 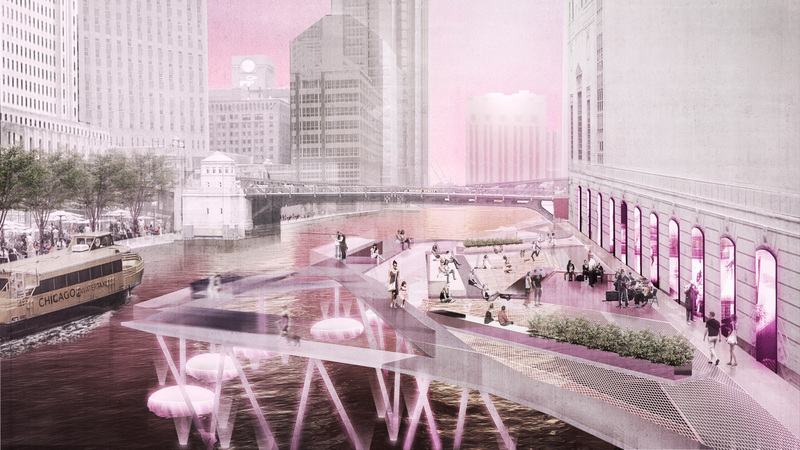 Located in EXPO 72 across the street from the Chicago Cultural Center, the exhibition, Chicago Urban River Edges Ideas Lab, presents the visions of nine firms for the Chicago River. 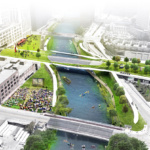 Chicago Urban River Edges Ideas Lab was initiated by the City of Chicago’s Department of Planning and Development and the Metropolitan Planning Council to solicit proposals for the city’s quickly evolving riverfront. 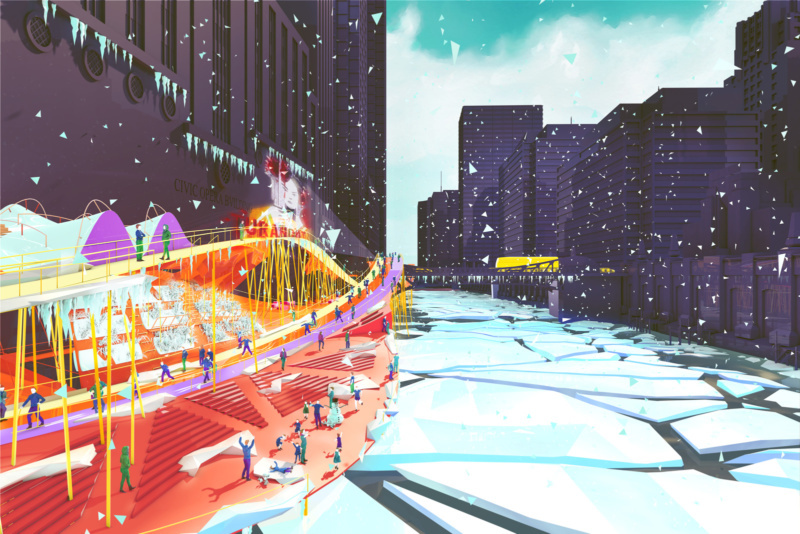 Firms participating in the show include David Adjaye, James Corner Field Operations, Perkins + Will, Ross Barney Architects, Sasaki, Site Design, SOM, Studio Gang Architects, and SWA. 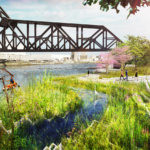 Each firm addressed three sites along the river with designs that ranged from outdoor theater spaces to water remediation and ecological classrooms. Other ideas included policy suggestions, such as SWA’s forest bonus, rather than a density bonus. 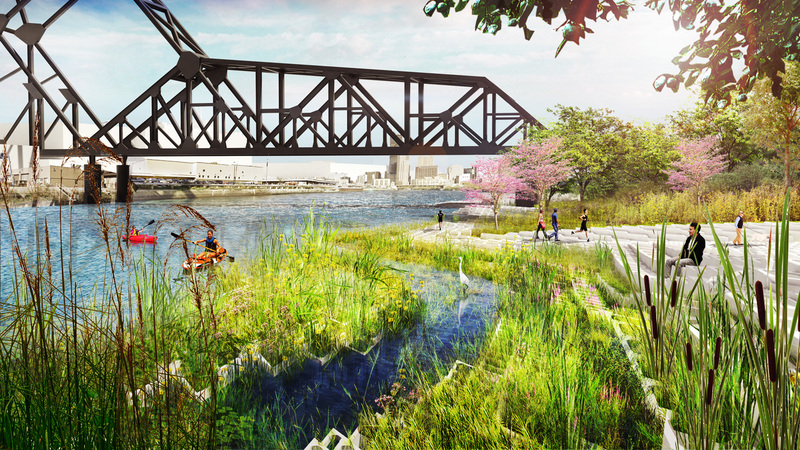 Multiple offices proposed ways of engaging more closely with the river itself, including James Corner Field Operation’s softened edge and Perkins+Will’s riverside beach. 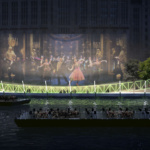 The three sections of the river addressed by the show are the Civic Opera House, the Congress Parkway, and the Air Line Bridge. 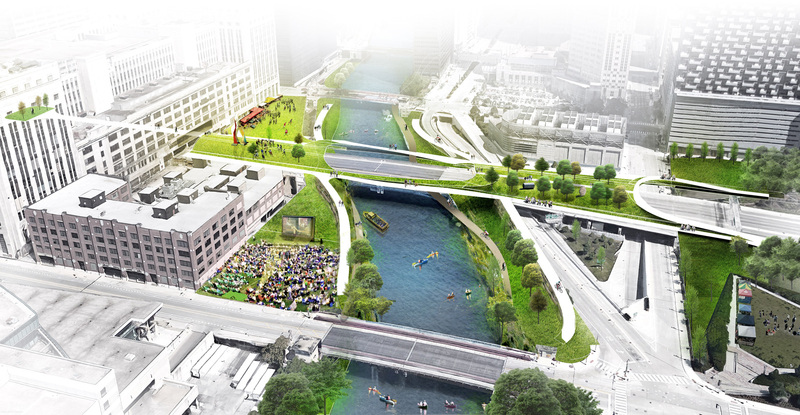 Each of these sites present different challenges which the city hopes to resolve. 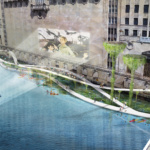 While large stretches of the riverfront have already been converted into the Chicago Riverwalk, there are over 156 miles that have yet to be developed or connected with public walkways and activity spaces. The initial downtown stretch of redeveloped space was designed by Ross Barney Architects and Sasaki, and was completed earlier this year. 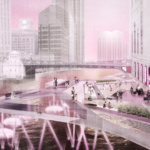 The exhibition, which was also designed by Ross Barney Architects, aims to engage public feedback and present ambitious yet feasible visions of the river’s future. 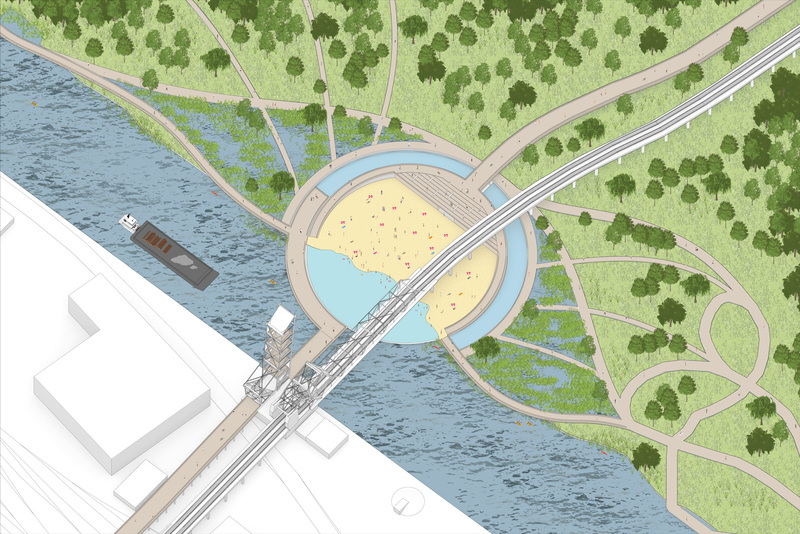 Throughout, large renderings with texts allow visitors to compare proposals side by side. 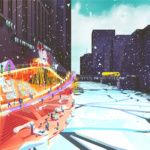 Those interested are directed to the project’s extensive website to watch interviews with the architects, watch animated shorts about the proposals, and send commentary to the city and designers. 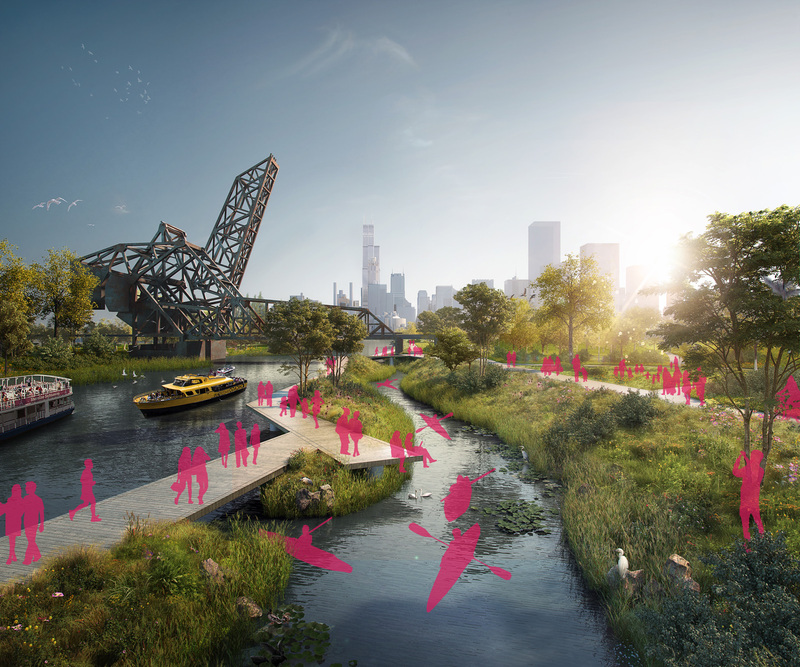 “We thought this would be a great way to bring together a bunch of very creative folks, as well as help Chicagoans begin to imagine how this could work and what their place in it would be,” explained Josh Ellis, vice president of Metropolitan Planning Council at the exhibition opening. 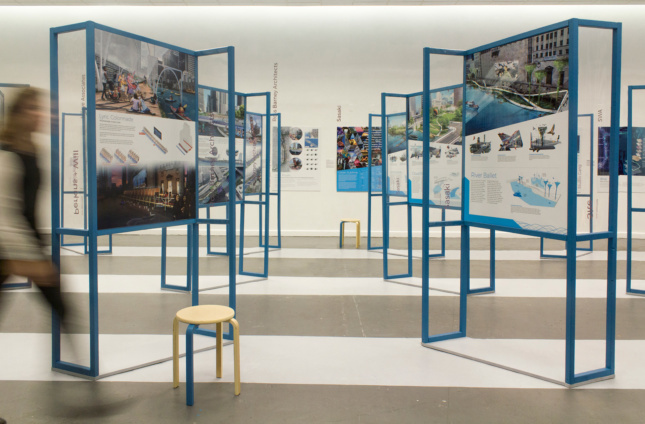 While the exhibition is not intended to be a competition, it is clear that each of the offices poured resources and brain power into the project. 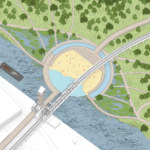 The Department of Planning and Development as well as the Mayor’s office have been explicit in their search for ideas for the future of the river.